09 | April | 2012 | Russ & Gary's "The Best Years of Music"
I was very much into R&B and Soul in the 1960’s and I actually purchased two LP’s from this legendary Memphis Soul producer, who we lost in 2010. Now Willie Mitchell was an accomplished musician (trumpet) and pioneered the hard hitting kick sound (usually played by drummer Al Jackson of Booker T & the MGs). Mitchell worked very closely with Al Green. So perhaps not a big Top 40 Hit Maker himself, Mitchell was a very successful musician who had a big impact on the industry. 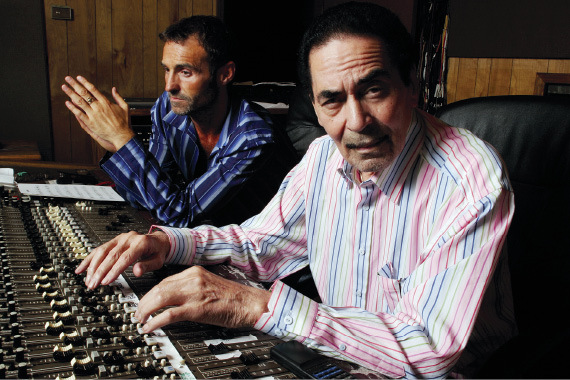 Best known as the man who signed Al Green to Hi Records and as the producer of Green‘s most popular records, Willie Mitchell had a successful recording career of his own during the mid-’60s before meeting Green. Born on March 23, 1928, in Ashland, MS, Mitchell was raised in Memphis, TN, and began studying music and arranging at an early age, taking up the trumpet at the age of eight and learning from pianist Ozie Horn (as well as drawing from such influences as Roy Eldridge and Harry James). After he was discharged from the Army in 1954, Mitchell moved back to Memphis, where he soon became a popular, local trumpet-playing bandleader — including Elvis Presley hiring the big band to play several private parties. By 1959, Mitchell had turned his attention to studio work and he signed on with Hi Records; he is often credited as being the creator of the oft-copied and instantly recognizable Hi sound (churning organ fills, sturdy horn arrangements, a steady 4/4 drumbeat, etc.). Mitchell Throughout the ’60s, Mitchell became a popular concert attraction on U.S. college campuses and he scored several moderately successful soul/dance hit singles, issuing a steady stream of solo releases for the Hi label, including such titles as Sunrise Serenade, It’s Dance Time, It’s What’s Happenin’, Hit Sound of Willie Mitchell, Ooh Baby, You Turn Me On, Willie Mitchell Live at the Royal, Solid Soul, and On Top. When the founder of Hi Records, Joe Cuoghi, died in 1970, Mitchell suddenly found himself in charge of the label. What could have been a turbulent transition turned out to be a smooth one: a year before Cuoghi‘s passing, Mitchell had signed an up-and-coming soul singer named Al Green to the label. …”Call Me (Come Back Home),” “I’m Still in Love with You,” “Here I Am (Come and Take Me),” “Let’s Stay Together,” “You Ought to Be with Me,” “Look at What You Done for Me,” “Let’s Get Married,” and others. Besides racking up hits with Green in the ’70s, Mitchell continued to issue his own solo recordings, including such further releases as Soul Bag, Robbins’ Nest, Hold It, Listen Dance, Many Moods of Willie Mitchell, and Willie Mitchell Live, in addition to producing albums for Ann Peebles and Syl Johnson. Mitchell also sporadically issued solo albums, but still continuously produced recordings for other artists, including Otis Clay, Jimmy King, Preston Shannon, and O.V. Wright, among others. The late ’90s saw several Mitchell compilations crop up (1998’s Hi Masters and 1999’s Soul Serenade: The Best of Willie Mitchell), which continued into the early 21st century with a double-disc anthology, Poppa Willie: The Hi Years, 1962-1974, as well as a pair of two-for-one CD releases (It’s What’s Happenin’/The Hit Sound of Willie Mitchell and Soul Serenade/Willie Mitchell Live). In addition to many musical accomplishments, Mitchell also owned and operated the Royal Recording Studio in Memphis, TN. He passed away in Memphis on January 5, 2010.